Their HAWK FX fund works well, it makes money. The issue is the broker the clients are required to use: SFX Markets. I sent the 5k minimum to open an account to run HAWK FX, but after almost 2 years running it, I got laid off, and I needed the money to pay my bills, so I requested a withdrawal... But who says that's possible? I ordered a wire transfer, after 3 days of not receiving any answer from them, I sent them an email, and two days after, they said their bank is having issues. After exchanging more emails, they suggested me to use the credit card withdrawal. But who says that's possible too? The status in the financial tab says processing (6 days now), which usually takes 24 hours in other brokers. They usually take 2 - 3 days to answer emails, and very unsatisfactorily. So, if you don't wanna get stressed out, begging them to give back your own hard earned money, don't open an account with them. I'm feeling like an idiot for trusting them in the past, so I definitely DO NOT recommend their services. Returns and more are as advertised by Nordhill Capital team. I have opened an account here recently because their brokerage CHARTER PRIME is now regulated and before was a SV company. So far they have good returns and it matches their myFXbook. The company seems to be very focused on Chinese clients but does answer emails relatively fast and trades almost everyday. Nothing to complain about and withdrawals are fast. Good company. Opened Managed Traders Account March 2016. Most months have been profitable, about 2-3 losing months. Very reasonable. Trades are mostly short term. Close fast, etc. Pleasing. Emails/phone calls do reply reasonably fast. Broker also has fast support that they use for the aggressive program that I am utilising at moment. They have two choices of brokers as well. Good company, I feel like I can trust these people. Not bad, getting better, very good support. Hi all, Ive used Nordhill since March 2016 and its not been an easy ride for the last 6 months. With a slight up-tick in month 1 since April the performance has been sub-par. In retrospect the algorithm they employed in both HyperFX (my old product) then SharkFX was not able to cope with the USD/GBP/EUR volatility and appears to have caused the issue. Since Mid October I've been using their new managed service HawkFX and its been trading very well. In fact I'm almost back at parity with my original investment. While its never great to see less than optimal performance I'm not shy to see negative trade and negative months. It is reassuring in a day an age where Ponzi schemes in FX pop up all the time. 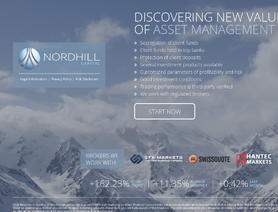 Unfortunately I cannot recommend Nordhill Capital. I have had $6000 USD in two of their performance accounts, both of which under performed. I am now at a 10.5% draw down in equity and am likely withdrawing my funds now. I expect some draw down but I have had consistent losses over the last 6 months. I have screen shots of my account performance that I will try and add to show everyone the poor performance and prove I'm not making it up. The sad thing is they have made about $500 profit from me as they take a 30% cut of all profit trades. No risk, only reward for the Nordhill traders. It's very transparent, they provide myfxbook verified accounts, you can invest in 3 different systems and the client can choose what type of investment best fits for him/her: Low risk, Standard and Agressive, you can also diversity you risk, you can put a portion at Low risk, another portion at Standard and another portion at the Agressive mode, respecting the minimum amount required. Also the client can choose which broker he/she want to put the money: SFX Markets, Hantec Markets and Swiss Quotes, but if you have a preferred broker, you can submit a request and they can check if it fits on their trading style.